Imagine what it feels like to publish a book about your life at 95 years old!? That’s exactly what Franklin Macon, Tuskegee Airman, just did! 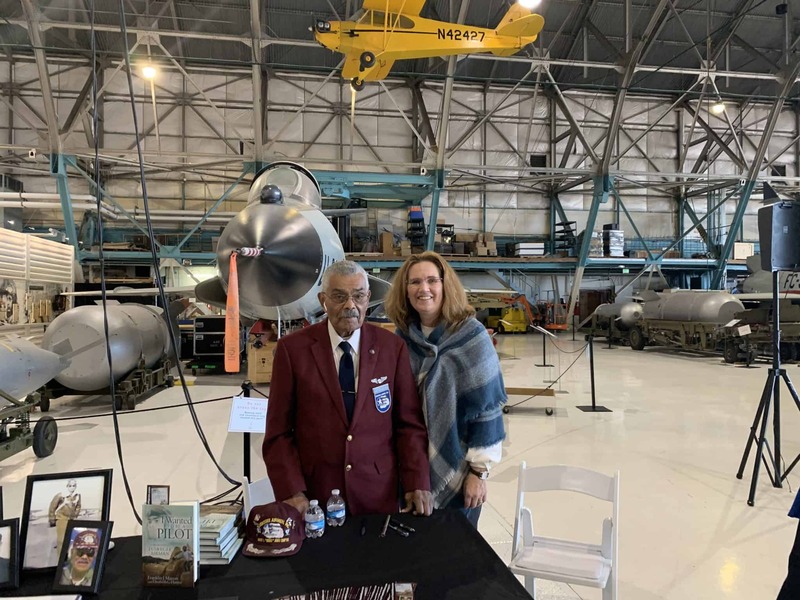 On November 20, 2018 at the Wings Over the Rockies Air and Space Museum in Denver, CO, Frank celebrated his official book launch day! He was joined with his co-author, Elizabeth Harper and team. The morning started at the museum with a line 60 people long when the doors opened. We had to delay Frank’s talk to the crowd due to the number of people still in line waiting to meet him. There was so much excitement. In attendance there was one man wearing a World War II hat and in a wheelchair, then there were young school children already out for Thanksgiving break and a few that missed school to attend. What a treat for the children to witness and hear living history. High above Frank’s head, hanging from the ceiling, was the same type of plane that he first soloed in as a young man. He also learned that there was a plane from the Alexander Aircraft manufacturing plant in the museum. He had a delightful time looking at both planes. After the presentation people stayed to take pictures with Frank, to say thank you for his service and to talk about his struggle with dyslexia. One mom in attendance sent this note after the event. My family thoroughly enjoyed meeting Mr Franklin Macon today at the Wings event. The spool tractors were a wonderful activity to busy short attention spans and connect children to childhood of the past. In my family it sparked conversations with my children and their great great uncle. I think the challenges of a large public venue were compensated with the slides, question and answer period and the warmth of Mr Macon and team. The highlight that we have been talking about all evening and sharing with our family, friends and neighbors was Mr Macon’s openness about his struggles with dyslexia. The lines were long to get into Wings over the Rockies this morning and we found ourselves arriving late. As we approached the presentation we arrived just in time to hear Mr Macon talk about his struggle with dyslexia. My children all looked at each other and especially at my 8 year old son. He has been recently diagnosed with learning disabilities and while not officially dyslexia (yet) his doctor is almost certain it is his primary struggle. We approached Mr Macon after the presentation was over with the hopes of saying hi and maybe getting an autograph. He went above and beyond and took the time to give my son a few tips, even demonstrating in his book how he keeps the words from jumping around. Thank you so much. Please share our gratitude, my son’s gratitude, and that of our extended family with Mr Macon.